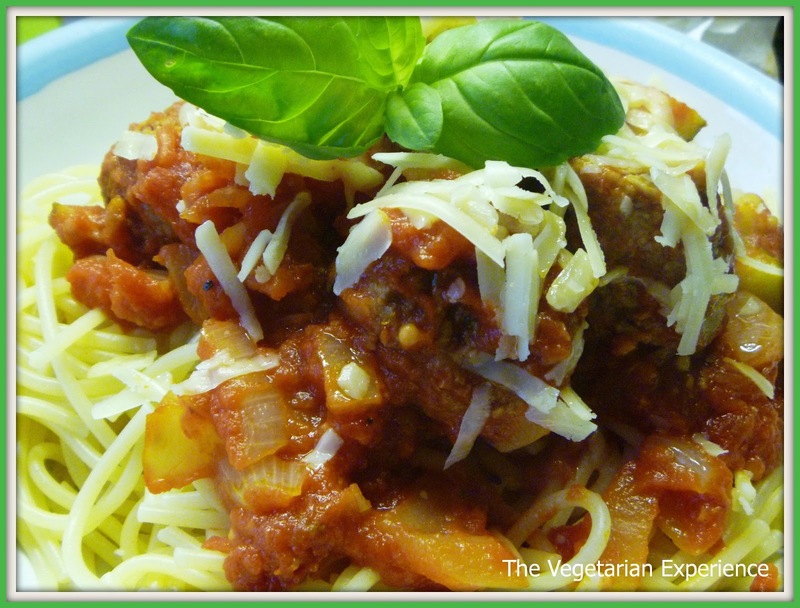 Today is another Meat-free Monday, and so I am featuring a delicious meat-free dish - Vegetarian Meatballs in Tomato Sauce with Spaghetti. 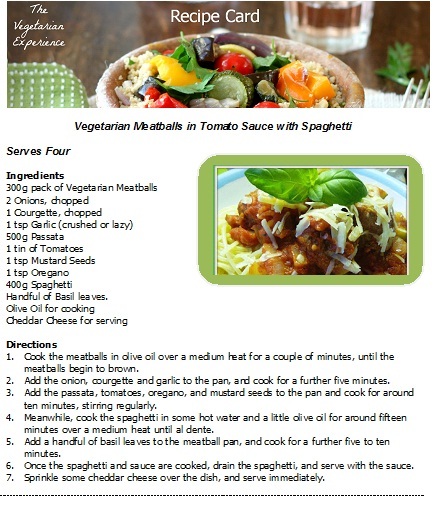 This is a great dish for vegetarians, and also a great dish for those who would typically eat meat. It is also a delicious hearty, filling meal. 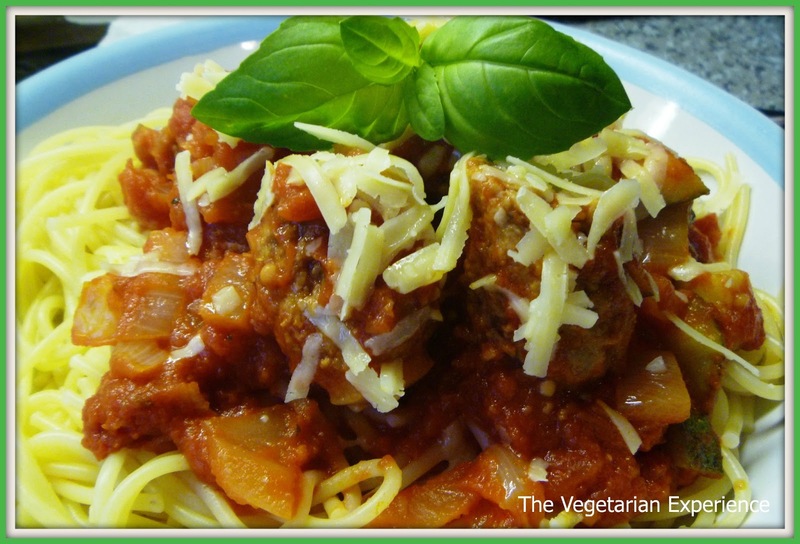 Although I know meat-substitutes are not always a desired food for all vegetarians, I like using them in my cooking, especially if we have my kid's friends round who typically expect a meat dish. Vegetarian balls are a great alternative to the meat version. For ease, you could just add a jar of tomato based sauce, but I prefer to make my own, so I know what is going into it, and to try and get some veggies into my family at the same time. You can vary the vegetables you use. This week, I didn't buy peppers at the supermarket, as I wasn't happy with their quality, but you could also use peppers in the dish, or some sweetcorn, or whatever you like! Enjoy this delicious meat-free Monday dish! Cook the meatballs in olive oil over a medium heat for a couple of minutes, until the meatballs begin to brown. Add the onion, courgette and garlic to the pan, and cook for a further five minutes. 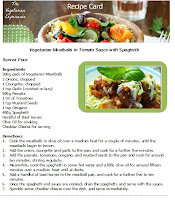 Add the passata, tomatoes, oregano, and mustard seeds to the pan and cook for around ten minutes, stirring regularly. Meanwhile, cook the spaghetti in some hot water and a little olive oil for around fifteen minutes over a medium heat until al dente. Add a handful of basil leaves to the meatball pan, and cook for a further five to ten minutes. Once the spaghetti and sauce are cooked, drain the spaghetti, and serve with the sauce. Sprinkle some cheddar cheese over the dish, and serve immediately.